Freediver Course - Tide to Table Package - August 2019 West Coast N.E.S.T. Learn the fundamentals of Freediving in a safe & controlled environment with Bottom Dwellers Freediving! Also join the Freedive Harvester course for the ultimate Tide to Table Dining Experience in partnership with Tofino Resort + Marina. In this course you will be taught the fundamental building blocks of Freediving. You will learn freediving skills and techniques and experience first hand how these will benefit you within an aquatic environment. You will learn about the physics and physiology of freediving and how your body adapts to being at depth. The PFI Freediver course will allow you to reach depths of up to 20m/66' deep during open water sessions. In confined water sessions the PFI Freediver course will also have you explore and practice Static Apnea with the goal of increasing your breath-hold capabilities and learning to better manage your body for freediving. Learn about proper freediving equipment: why it works and how to maintain it. Also available is the Freedive Harvesting Course. 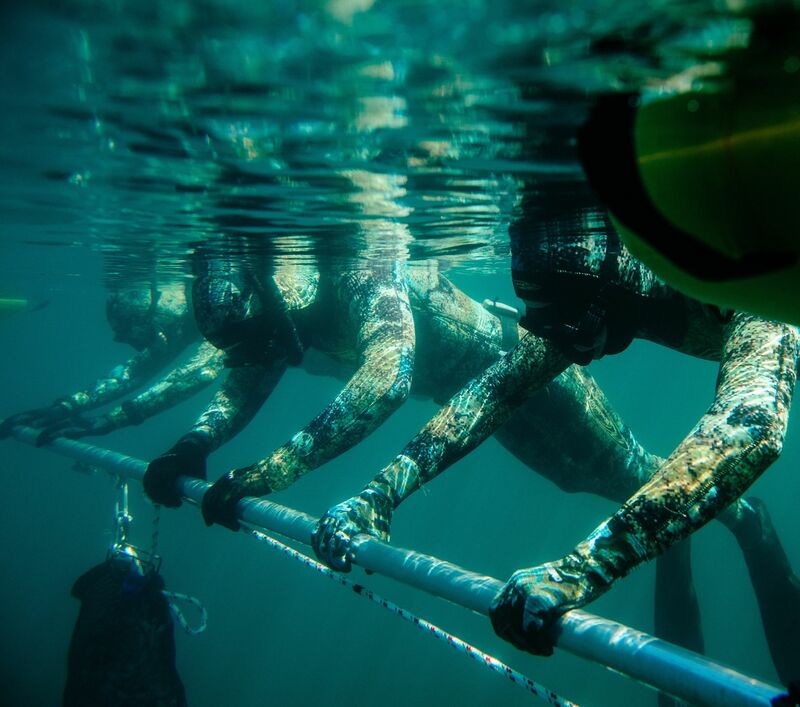 This course bridges the gap for the 'certified freediver' allowing you to grow as a safe and competent freediver, adapting to safe, efficient and conscientious Freedive-Harvesting and Spearfishing methods and practices. Combine this harvesting course with your Freediver Course to create the ultimate Tide to Table Experience. All Course and Package instruction and activity will occur at or depart from Tofino Resort + Marina via TRM’s Sprinter Van or by Boat. To make your course and stay easy, comfortable and convenient if you’re in need of accommodation, follow this link to see what is available on site during the period of your course.